I am trying yet again to lose those unwanted pounds that crept on over the holiday season. In winter I am just not as active and there are countless get togethers in the fall - Halloween, Holiday parties, the feast on Christmas Day and smorgasbord of delectables always available at New Year's Eve celebrations. It was time to move the scale number down a bit. Diets really do not work in the long run, so I try to make small changes, less bread and cheese in particular. No eating after 8 p.m. is another. If I need a snack, I eat my Hummus with raw veggies stead of crackers or tortilla chips. I try to move more each day. And I downloaded the app I used before into my new phone - LoseIt! You decide a goal weight and how fast you want to get there. It sets a daily caloric limit (too low, but for a reason). Then you enter the food you eat. It scans barcodes to help make it easy and I input recipes or food combos I eat more often into the memory. You can access the app online to make adding specific foods easier. The reason the daily caloric allowance is low is that calories are added to this amount every time your input any daily exercise. What you do can be a simple as walking, dancing, calisthenics or even house cleaning. Just input what you did and the total minutes you did it for. Voila - you instantly know how much more you get to eat that day as it ups the calorie count immediately. I love how it brings home how many calories the food you eat actually has (Chia seeds was a total shocker) and how much more you can eat if you're active. It's an eye opener. There are so many amazing recipes that get shared on Facebook. I keep trying to keep track of them but they get buried on my newsfeed. Last night I was determined and dug around until I unearthed one that had caught my eye - Sausage Egg Roll In A Bowl from a blog site called Buns In My Oven. You can click the link to go to view the original recipe and watch the video. 1. Fabulous flavour. Both my husband and I loved it. I'll definitely make it again. And yes, it needs the full 4 cloves of garlic and tablespoon of ginger root! of toast with it to fill up. 4. I used turkey sausage to bring the calories and fat down a little. This recipe was very quick to make, especially since I used bagged coleslaw mix, and full of flavour. I definitely encourage you to give it a try. I did have a few leftovers as only 2 of us dined last night and can't wait to finish it off at lunch today. Add the garlic and ginger root and saute for a few minutes. Add the cabbage and continue cooking stirring frequently until it has softened, adding soy sauce for the last couple minutes of cooking. Remove from heat. Sprinkle on green onions and sesame oil and toss until fully combined. Separate into large individual bowls and serve. Note - For me this was 3 servings max. My guys eat bigger portions, so this recipe would have served 2 with 1 cup rice added to each. For my size serving, the recipe would serve 3 with no rice added. 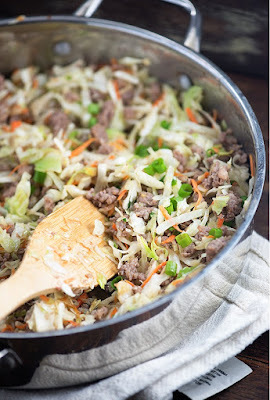 If you use the full pound of sausage that helps serve more, but I still think you'd need to up the cabbage to 8 cups (and perhaps the other ingredients) if you are feeding 4. Just my personal opinion. It all depends on who you are feeding.